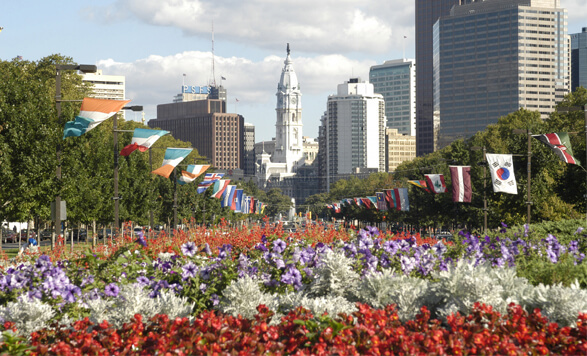 Philadelphia is the nation’s epicenter of horticultural excellence and home to exceptional gardens and parks. This handy map, developed by the Pennsylvania Horticultural Society, guides you through Center City gardens and parks, many of which are managed by PHS in partnership with the city. Begin your tour at one of four historic squares—Logan, Rittenhouse, Washington or Frankin—and see where the path leads! And be sure to take a look at our Historic Homes and Gardens itinerary, as well. Across from the Cathedral Basilica of Saints Peter and Paul at 18th and the Parkway, you’ll find Sister Cities Park, a picturesque setting for imaginative play and relaxation, with a visitor center and café offering signature Philadelphia products. Children can enjoy nature in an urban setting, “hike” along a meandering nature path and stream inspired by Philadelphia’s beautiful Wissahickon gorge, launch toy sailboats on a pond and play in a splash fountain.